WMT reports 867 indexed pages and 690 pages blocked by robots.txt. GSC reports 345 indexed pages. 345 is a much more realistic figure. I have the impression that this unnatural rise of indexed pages reported by wmt hurts the rankings. Any idea what could be happening here? I generally never complain when Google indexes my pages. In your case, about the only way I could see this impacting your rankings would be if you have competing pages, and you confuse Google as to which page should be listed in any given search query. Then the use of a canonical url would solve that issue. But anything could happen with Google. Have you seen any decrease in traffic? Any decrease in your CTR to your money pages ? Check those metrics and if they have not been impacted I would think you are unduly concerned. Impressions, CTR, traffic etc look normal. Last time I had a big rise in indexed pages it was an issue that had to be fixed. I do not have 867 pages in my website. The two different google tools display a different result. I am afraid google is somehow confused, and this is not a good thing. I looked for errors, I do use canonical. My site seems ok. So what was the fix ? You say you do not have 867 pages on your site, so Google is seeing something. Have you considered that the site may be hacked ? I have another 40 questions to ask. Providing the domain name will eliminate most of these questions. We can then run our own scans on the site to see what problems may be lurking. I don't think the site is hacked, but I will scan it again. I also used the canonical for some duplicate pages. I found 670 urls. The number Google is reporting is more accurate than you think. You have way more than 345 pages by far ! Page 645 is the one you have referenced with your rel=canonical and is a self referencing canonical. Pages 646. 647, and 648 all reference Page 645 as the page to give the juice to, they are all dynamic urls in that they contain "? 's" in them. Yes the Q2A does explicitly solves the issue of which page to funnel the almighty juice to. What it doesn't do is prevent Google from indexing those pages. # No need to do this. Q2A uses the Canonical tag. Works perfectly. 670 total pages - 405 dynamic duplicate pages = 265 unique pages without "? 's", aka dynamic urls. My suggestion would be to re-activate this line in your robots.txt and give it a couple of weeks and see if the total number of pages being indexed returns to what you call normal. I am still of the opinion you are unduly worried in this explicit situation, why ? Because you are using the rel=canonical to solve any duplicate issue. I would consider the 1493 empty image alt text opportunities you have omitted, something to fix tho. Last edited by KnowOneSpecial; May 17th, 2018 at 08:09 AM. Thank you very much for the in-depth answer. The forum section of the website (the one that is not blocked by robots.txt) has about 340 unuque pages. Unuque I mean, not including the ones with ?show=. The rest of the website is about 20 pages. So it should be about 360 total. You said: "All of these pages here are very much index-able by Google"
So unless Google is lying, the canonical tag works perfectly passing the juice and preventing indexing of the wrong pages. GSC reports 345 indexed pages, which seems closer to reality. WMT reports 867. Obviously WMT counts pages in a different way. Maybe WMT counts the ?show= pages too. This could be an explanation. Last edited by bobptz; May 17th, 2018 at 08:40 AM. You are under some miss conceptions, lets clear up those issues first ! 1. The canonical url only determines which page gets the juice. 2. The canonical url was never designed to prevent indexing a page and in fact does not prevent indexing by Google or any other search engine. 3. 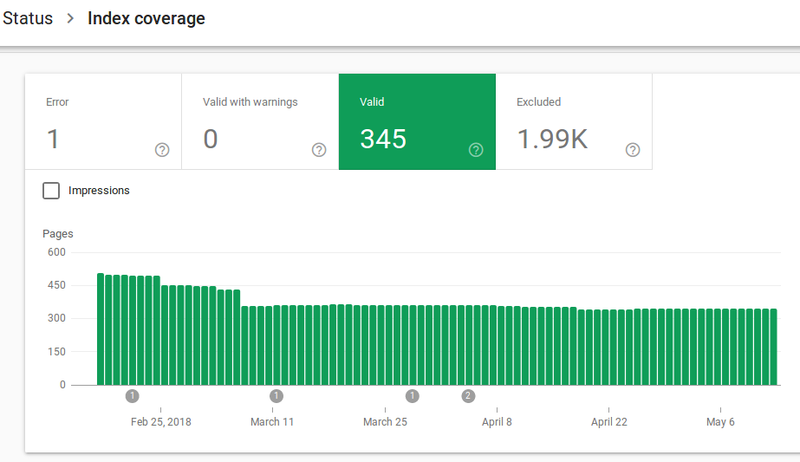 The Site: command only shows you what pages have been indexed by Google and then it only shows you a partial list and is known to not provide all indexed pages of large sites. So your usage of the command for this purpose is FLAWED ! Using this command to determine if a page is index-able does not work, you are using the command WRONG! I did tell you that you have 405 other pages that do have this indexing issue! You also need to understand just because you specify in your robots.txt to not allow this, and in fact some people do rely upon it to prevent indexing, it is not fool proof. I only suggested you put that line back in to help you determine if that line being removed caused the issue. To make a page non-index-able do one of the following two things...nether of which you have implemented ! Thank you for all this great info. Indeed I relied a lot in the "site:" command. Let me read all this again tomorrow. It is late now and had a couple of beers already. number of indexed pages in decline ?